Includes power adapter or power via Poe. Concurrent dual band. 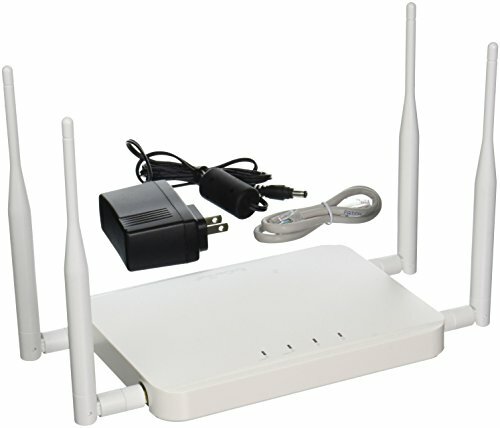 2.4 GHz (802.11n, up to 300 Mbps) and 5 GHz (801.11ac AC1200, up to 866 Mbps). 28 dBmV high transmit power. Two stream, band steering shifts dual band clients to 5 GHz. Guest network option. Gigabit Ethernet port for 802.3at Poe switches. Two 2.4 GHz detachable. Two 5 GHz Omni directional antennas. Monitor with EnGenius EZ Controller software. SSID to VLAN tagging. Ideal for large homes, startups, small and medium sized businesses, multi floor buildings, seamless roaming with PMKSA. White color. Made in Taiwan. Best wireless performance -802.11ac wireless speeds of up to 867 Mbps on the 5 GHz band and 300 Mbps on the 2.4GHz band. Extends wireless coverage - up to 26 dBm transmit power on both the 2.4 GHz and 5 GHz frequency bands, and 4 detachable 5 dBi Omni-directional antennas.